Design by Humans: Leap Day Flash Sale and free WORLDWIDE shipping! - Blog @ That Awesome Shirt! 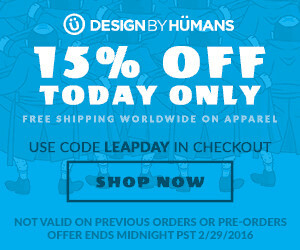 Design by Humans: Leap Day Flash Sale and free WORLDWIDE shipping! 15% off sitewide and free WORLDWIDE shipping on apparel! DBH is having a Leap Day Flash Sale. It's a sale 4 years in the making and it only lasts for 24 hours! There's two parts to the sale: sitewide coupon & free worldwide shipping on apparel.